Anna of Onepinkplum is drawn to the meditative qualities of embroidery and textile making. These processes cannot be rushed, and demand a level of concentration and patience often missing from our fast-paced lives. 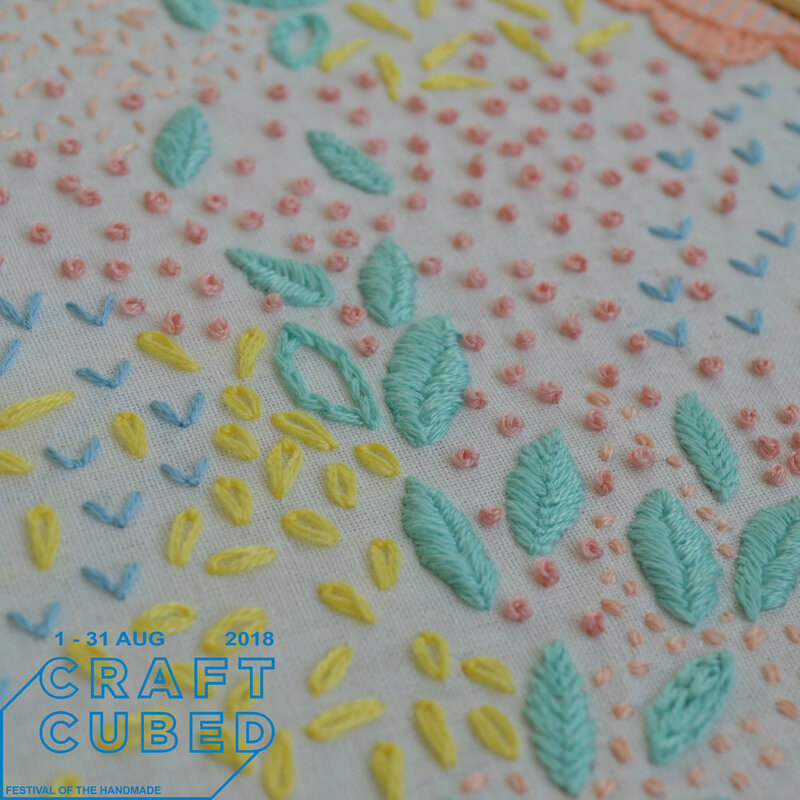 Anna will be holding embroidery workshops as part of the Craft Cubed Festival for those who would like to learn and create a relaxing new skill. The handmade has been a constant throughout my life. I need to create something with my hands, it helps me to refocus, relax and also connect. Our world today is so busy and chaotic with so many choices for everything. Making with my hands is the complete opposite. I have to slow down and think one stitch or one step at a time as I focus on the process. In a way this slower pace always me to reflect and consider what I am doing, what is happening in the world and also what I would like to be doing next. When I have had major stressors (finishing a doctorate) or life events (hello motherhood!) being able to take a few moments to focus on what I am making with my hands has been the biggest blessing for me. How would you describe your craft community? Crafting is often something I do at night or on a Sunday afternoon or while the kids play for a few minutes. As a quiet maker, I have found Instagram and the online community to be wonderful as a way to connect globally with like-minded people. Teaching embroidery workshops over the past 18 months, has been a wonderful way for me to connect in person with other people. I have gained so much from these interactions. I started studying textile design at RMIT this year and my community has grown tremendously over the past 7 months as a result. My eyes have been opened up to the possibilities as a textile designer and my head is swirling with ideas from being part of this community. I was given a small tapestry loom and then a knitting Nancy wool tool when I must have been about 4 or 5 which led to an early love of everything textile. I have distinct memories of sitting in my grandparent's lounge room passing the shuttle over and under and over and under as patiently as I could at that age. I developed a love for embroidery when along with a group of friends in my 4th grade class, we persuaded the owner of the gift shop, sandwiched between the IGA and Chinese restaurant, to teach us embroidery in the shop's tea room. I remember learning the basic stitches and struggling with the elusive French knot. What is your philosophy or motto when it comes to creativity? In many ways my creativity is about the process. It is about slowly trying new ideas and seeing where they go, how the ideas can combine and recalibrate until I have a design like that I imagined. Another part of my creativity is about practice and repetition. For example when I'm knitting or covering a piece of fabric with the same embroidery stitch, the rhythm can help me to refocus and ground myself. In this way anyone can be creative through time and practice. As a mother of two small children I find seeing the world through their eyes encourages me to see details I would often miss - the way the bird moves or the colours in the weed on the side of road. We spend a lot of time in gardens and parks which provide amazing colour and pattern inspiration. I try to visit as many galleries and art events as possible with my children so we can discuss art and design together - I find I learn so much from their questions and the details they are attracted to. Recent favourites have been the Australian Tapestry Workshop and the now finished biennial at NGV (which we visited many times). I just discovered the podcast rough translation which I'm enjoying as well as the invisibilia podcast. I have almost finished reading A Little Life, a very engaging but serious and long read. I do most of my making at home. I have my floor weaving loom, sewing machine and too much wool and embroidery thread in our spare room. I have a basket with my current projects in it, that travels around the house so I can sneak a few more stitches in around my children's activities. I also have the pleasure of learning and creating in the amazing textile studios at RMIT. I'm looking forward to attending the festival of natural dyes.